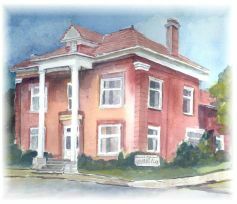 Since 1903, the corner of Webster Avenue and Second Street has been home to the Greater Muskegon Woman's Club. Located right next to the Muskegon Museum of Art and within walking distance of most of Muskegon's downtown attractions. 280 West Webster Avenue, Muskegon, Michigan 49440. Hours: Club tours on request. We would like to thank all our sponsors for their generous contributions. Your support is greatly appreciated. Please contact the webmaster for information about sponsoring this site or any other function of the GMWC. Disclaimer of Endorsement and Liability. The Greater Muskegon Woman's Club is 501(c)(3) non-profit organization and a 509(a)(2) public charity. Contributions to the Greater Muskegon Woman's Club are deductible under section 170 of the IRS Tax Code. Check with your tax professional to see if your contribution qualifies. Copyright © 2016 Greater Muskegon Woman's Club. All Rights Reserved. please email the President for the new password.